When you do not have the cash for a full-on remodel, a spanking new paint job will add oomph to a kitchen without having to overhaul everything else. But here is the thing — there are a bazillion colors to choose from at your local home improvement store. And that can make finding the best shade for your cooking space a mind-boggling chore. So, how do you pick? To help you have that ah-a moment we are sharing our favorite hues for cooking spaces. From neutral palettes to bold color schemes here are 26 kitchen paint ideas you can easily copy. Not too long ago pink walls were usually relegated to kiddie bedrooms or retro bathrooms. But thanks to the rise of millennial pink, pink-colored walls are popping up everywhere. An example is the salmon pink wall in this mostly white kitchen by Casa Colombo and Serboli Architecture based in Barcelona, Spain. But the colorful goodness does not stop there. For a touch of lovely contrast, they painted the shutter apple green. Various shades of blue wash over this white kitchen by Vidal Design Collaborative a design and construction firm based in Southern California. The wall that carves out the breakfast nook is a paint shade called Soft Sky by Benjamin Moore. The pretty tile backsplash repeats the color. Lower cabinets painted a shade called Bright Yellow by Benjamin Moore light up this charming kitchen by the duo behind Alys Design located in Pittsboro, North Carolina. The sunshiny hue coordinates beautifully with the pale wood walls and the white platinum quartz countertop. Striking strokes of room uplifting colors add zip to this retro kitchen by Alison Kandler, an interior designer based in Santa Monica, California. The painted, vintage-inspired screen door is a cheerful shade of yellow. The cabinets are an earthy hue called Rolling Hill Green by Benjamin Moore. The single shudder on the right was distressed with orange chalk paint. Red, white, blue is the winning color combination that lends a heaping dose of pep to this kitchen by British Standard Cupboards situated in the U.K. The retro-styled cooking space features two-tone cabinets, which offset a bold-colored refrigerator. The crisp, white upper walls lend an open and airy vibe. The geometric floor tile is a modern touch that keeps the room from feeling too kitschy. Pewter gray shaker styled cabinets jump out against a fresh, white backdrop in this modern farmhouse kitchen by Studio McGee, an interior design firm based in Salt Lake City, Utah. We love this color combo because it is both neutral and chic. Black Lacquer Design based in Los Angeles, California is known for creating thoroughly modern spaces filled with striking colors and attention-grabbing patterns. Here the firm combines a bold pattern floor tile with pastel cabinetry in a paint color called Mint Julep by Benjamin Moore. The result is an incredibly fresh cooking space that feels both stylish and approachable. If you crave bold hues, we think kitchens are the perfect place to satisfy your hunger. 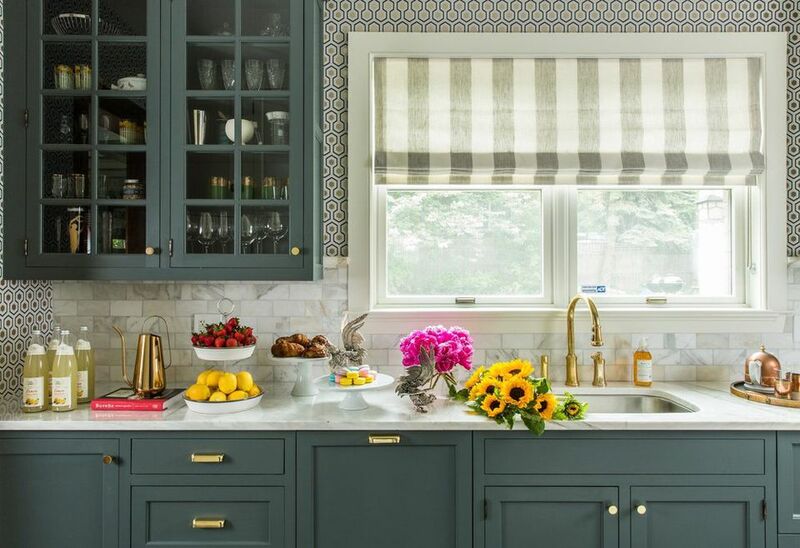 Case in point, this colorful kitchen by interior designer Janet Gridley based in Dallas, Texas. The cooking space reflects the homeowner's love of bright colors. Our favorite feature is the patterned floor. Instead of ripping out the original wood floor during the renovation, it was given a brand-new look using porch and patio floor paint in white and blue. A wall in a frothy shade called orange creamsicle by Benjamin and Moore brightens up this white cooking space by interior design firm Nimu Equipo based in Madrid, Spain. The kitchen island painted a striking shade of navy blue lends colorful contrast. Here is how the talented designers at Dittrich Hudson Vasetti Architects situated in the U.K., used paint to spruce up a simple, white kitchen. They painted the backsplash portion of the wall shown a shade called Julep by Sherman-Williams. Afterward, they installed a glass sheet to create a surface that is both water and stain resistant. The surrounding walls are a hue called Mindful Gray, also by Sherman- Williams. The color adds a little contrast to the white flat front cabinetry. Celebrate your culinary creativity with this multihued cabinets idea by the design team at Ande Bunbury Architects based in Melbourne, Australia. The eclectic cooking space incorporates seven different paint colors to make a Mondrian inspired statement. The walls were kept white to keep the room from feeling too busy. Vidal Design Collaborative, a firm situated in Southern California, is known for injecting pops of unexpected color in functional spaces. Here the design team painted a kitchen island in a pretty hue called Purple Cream by Behr. JAS Design Build based in Seattle, Washington, painted these kitchen cabinets a shade called Tidewater by Sherman-Williams. We love this cool color because it combines a dollop of minty blue with whisper-soft gray. The result is a refreshing, pale hue that feels soothing and fresh. This retro cooking space by Santa Monica, California based interior designer Alison Kandler has two cheerful paint ideas worth stealing. The old wood floor was enlivened with a colorful checker pattern. The brand-new kitchen island got a country farmhouse makeover thanks to a couple coats of Red Barn by Benjamin Moore. We love how a little paint can instantly personalize a cooking space. Here Nerland Building Restoration and Design based in San Francisco, California uses acid yellow to add zest to a gray and white kitchen. Copper Sky Renovations based in Atlanta, Georgia, gave the kitchen in this home a timeless boost with historical paint colors by Benjamin Moore. A hue called Hale Orange tops off the Palace Blue walls. The red lower cabinet on the right is Cornwallis Red. While different lighting conditions affect how we perceive colors, some shades respond more dramatically than others. A prime example is the cabinetry (all the same color) in this kitchen by The Jack and Mare Design and Build based in Portland, Oregon. Because of the bright light near the ceiling, the upper cabinets appear dark teal. Three paint colors set the tone in this French country kitchen by Witt Construction based in Saratoga Springs, New York. The arched structure concealing the oven hood is a brilliant shade of red. The cabinetry is a creamy yellow. The kitchen island is a moody blue-black. Cool colors make this mostly white cooking space by Sustainable Kitchens more inviting. The base cabinets on the right are a deep navy blue. The kitchen island is a soothing shade of sea foam green. Pitch black matte paint gives this bespoke kitchen by The Vawdrey House based in Worthing, England, extra visual depth. The white kitchen island in front keeps the room from feeling dark and moody. Are you thinking pink? Behold this cooking space by Harvey Jones Kitchens based in London. The pink kitchen island casts a rosy glow on the mostly white room. Pairing warm creamy colors with stark white hues can be confusing. Here is how to get the task done. Setting the tone in this kitchen by Grant K. Gibson Interior Design based in San Francisco, are walls painted Decorator's White by Benjamin Moore. It is pure, crisp shade without yellow or blue undertones, so it pairs beautifully with anything like these cabinets in Bavarian Cream also by Benjamin Moore. Show off your cabinet's wood grain with a color washing painting technique. In this chic cooking space by Sustainable Kitchens based in the U.K., a couple of thin coats of blue paint adds depth to the natural wood grain. A gorgeous shade of matte green by Sherman-Williams called Hunt Club gives this cooking space by Turek Design based in New York City an elegant and modern vibe.